Today’s Final Jeopardy answer (in the category Futuristic Fiction) and game statistics for the Friday, July 20, 2018 game between Dave Mattingly, Emily Moore, and 7-day champion Ryan Fenster. Today’s Final Jeopardy answer (in the category 1970s Movies) and game statistics for the Thursday, July 19, 2018 game between Michelle Mueckler, Justin Moody, and 6-day champion Ryan Fenster. Today’s Final Jeopardy answer (in the category 20th Century Presidential Elections) and game statistics for the Wednesday, July 18, 2018 game between Caitlion O’Neill, Kyle Adams, and 5-day champion Ryan Fenster. 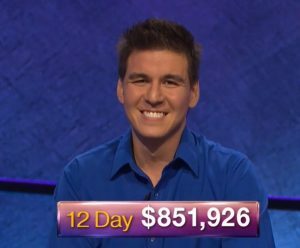 Today’s Final Jeopardy answer (in the category World Capital Sightseeing) and game statistics for the Tuesday, July 17, 2018 game between 4-day champion Ryan Fenster, Bunny Miller, and 3-day champion Michelle Cabral. Toronto’s Michelle Cabral returns as Jeopardy! champion; see who joins her here!